Which storage engine are you using for your cache? InnoDB? 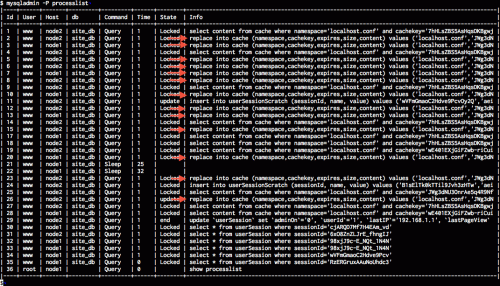 You're paying a lot of overhead on each cache update if so (but you can't use memory due to the blob). Also, if each replace takes 2s, is read access blocked while the replace is in progress? We're using MyISAM, which has table-level locks. A write lock prevents all reading from the entire table. Now that the emergency is over, we're looking into writing a CHI driver for HandlerSocket, which bypasses the MySQL query parser and just does direct key lookups at much faster speeds. InnoDB wouldn't solve all my problems, but it would solve a couple I suspect. WebGUI 8 is InnoDB, we're currently looking at if it's possible in WebGUI 7 to move all the non-fulltext tables to InnoDB, along with other solutions like HandlerSocket, but these are more intense solutions. The CHI solution above took me no more than 30 minutes to hammer out.